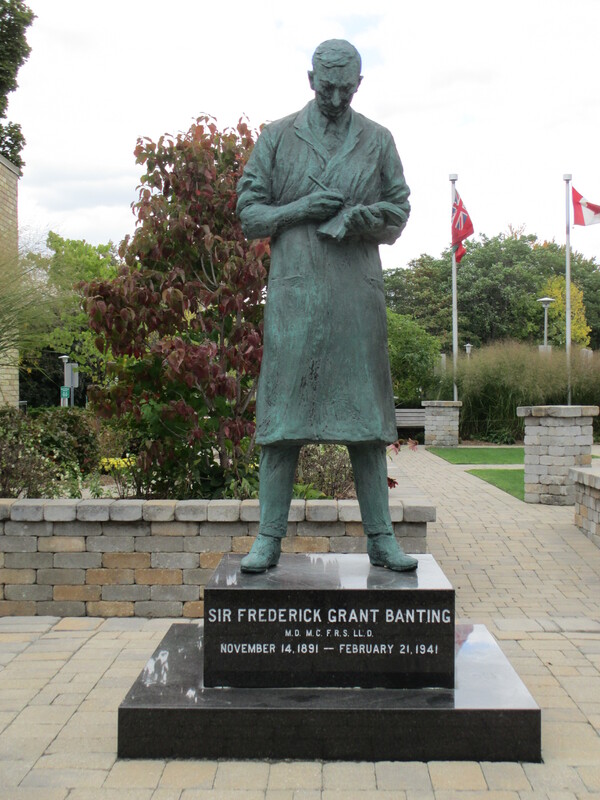 This past week I’ve had the opportunity to explore the Sir Frederick G. Banting Square in more detail. It’s located right outside of Banting House and contains several sculptures that help to connect Banting’s work and what we present inside the museum. I was able to get a closer look at the Flame of Hope, globe sculpture, and statue of Banting, as Grant and I measured the dimensions of each so we could add these objects the museum records database. I have walked past these sculptures every time I’ve come to Banting House, but cataloging them gave me a chance to dig deeper into their significance and history at the Banting House National Historic Site of Canada. The statue of Banting depicts him on October 31, 1920 as he wrote down his hypothesis that led to the discovery of insulin and is the focal point of the Square. It was created by John Miecznikowski and uncovered at a formal ceremony on July 7, 1989 when Her Majesty Queen Elizabeth The Queen Mother visited Banting House. It took Miecznikowski one year to create the statue and he created a number of smaller prototypes before the statue was revealed in the square. The statue really helps to connect Banting and the house here in London. It helps to tell the story of how insulin was discovered in a process that started with twenty-five words that were scribbled by Banting in the middle of the night. The statue of Sir Frederick G. Banting as he wrote down his hypothesis for insulin. The Flame of Hope was unveiled the same day as the statue of Banting and was lit by the Queen Mother and The Honourable Judge John M. Seneshen. The Flame was snuffed out about two years after it was lit and Her Majesty requested that it be rekindled. It serves as a reminder of how much the discovery of insulin has helped people with diabetes but that there is still a lot of work to be done before a cure for the disease is found. It’s neat to walk past Banting House and see the Flame burning day and night. It truly is an interesting feature in the landscape around Banting House. 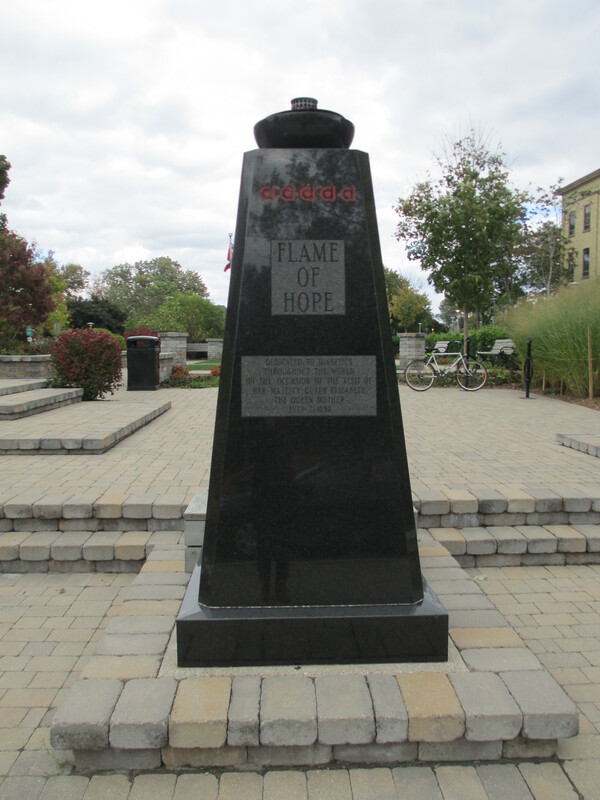 The Flame of Hope burning bright in the Sir Frederick G. Banting Square. 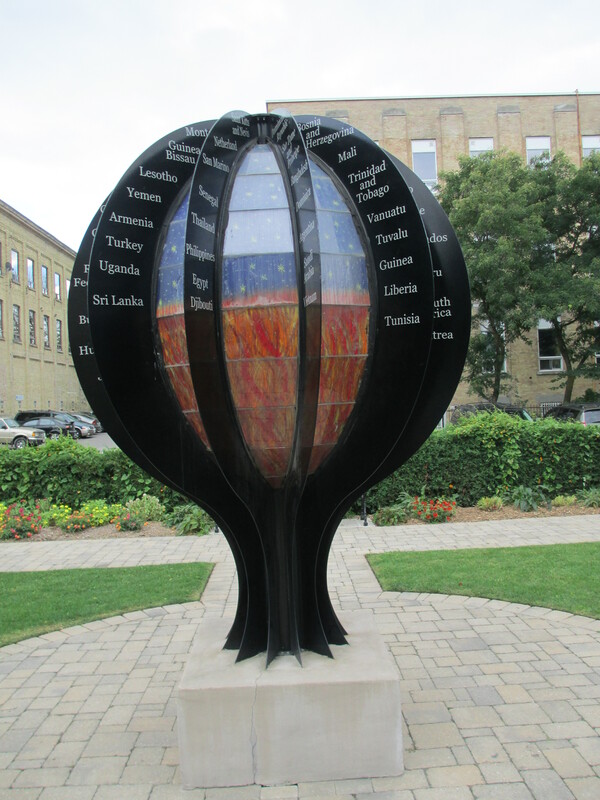 The globe sculpture was the most recent addition to the Sir Frederick G. Banting Square. It was finished in 2010 by Daniel Castillo and his team, and features the names of all of the countries in the world on the fins that surround the globe. It was placed on top of the time capsule that was entombed in 1991 and will be opened when a cure is found. The globe symbolizes how diabetes is a global issue and that everyone is impacted by the disease in one way to another. It’s also a colourful addition to the square and helps bring people into the site. A picture of the Globe sculpture out in the Square. For me, these sculptures present a unique way to learn more about Banting and Banting House in a less formal setting than the museum itself. They are not out in the Square just to help fill up space, but serve as another way to help interpret the site and get people interested in coming to visit the museum, too.